Posted on January 12, 2018 by treelawyer	tagged. We read a lot of newspapers. Some are truly excellent. Some are pretty good. A few are so-so. Then there’s the Norwalk, Ohio, Reflector, which we read for reasons too complex to explore here. Suffice it to say, if you have a parakeet, the Reflector is all the newspaper you’ll ever need. 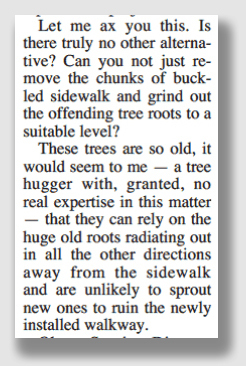 A couple of years ago, Reflector columnist Jim Busek complained about the city’s plan to axe 62 trees that are accused of wreaking havoc with sidewalks. Jim bemoaned the fact the City had removed a number of ash trees eight years ago (which he admitted was a “smart ash policy”). Jim was pleading for the 62 targeted trees, publicly and plaintively asking Norwalk Safety Director Josh Snyder whether there wasn’t an alternative to cutting down these old trees. Surely, Jim hypothesized, these at-risk trees are so mature that if the offending roots were cut, no new ones would dare grow, and the sidewalks would thus remain in place. Right? Sure thing, Jim. While Norwalk arborists are busy looking for the anti-root pixie dust that Jim figures will prevent new growth, we thought we’d consider the strange legal limbo in which property owners find themselves when tussling with municipalities over trees located on tree lawns. 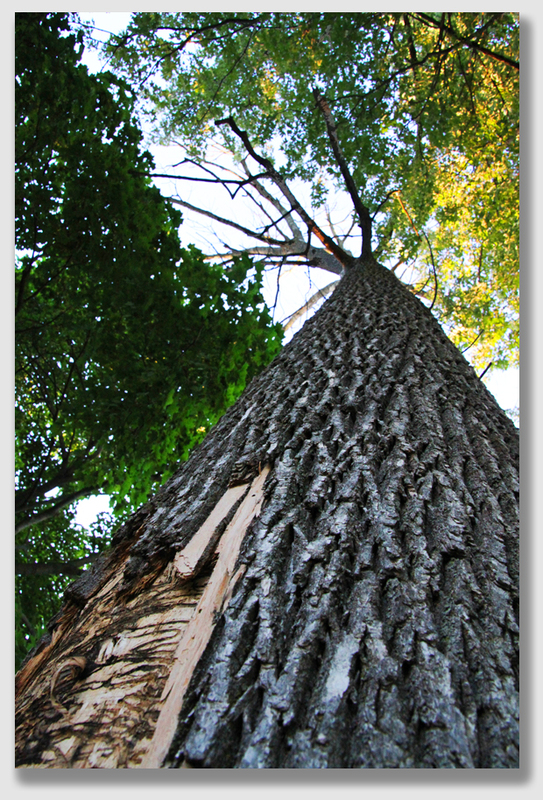 It turns out that Norwalk – known as the Maple City – didn’t rid itself of all of its ash trees. A few still stand on city streets, and ash borers haven’t overlooked them. So who’s responsible for those dead trees? Ironically, we’ve seen the issue arise before, as cities – operating under tight budgets – lean on homeowners to pay for the removal of tree lawn trees. So exactly whose problem is it? An interesting question… actually, two questions, and we’ll pick on Jim in order to answer them. Let’s say for example, that the dead ash on Jim Busek’s tree lawn falls on a motorist. Is Jim’s ash in a sling? And might the Maple City be liable as well? So someone’s gotta do something about the tree. But who – Jim or the Mayor? The infestation on this ash is pretty obvious. Let’s consider Jim’s liability. There’s no doubt that the tree lawn is Jim’s property, despite the fact it is subject to the City’s highway dedication. There’s a lot an owner can’t do with a tree lawn because of the City’s highway rights, but it’s still his or her property. Generally, the owner can plant and take down trees. And the fact that an owner has the right to add or remove trees suggests that he or she has a duty to as well. And what is that duty? In Wertz v. Cooper, one of Cooper’s trees fell onto Wertz’s fence during a storm. When Wertz sued her, she countered that she had no idea the tree was diseased, and that the tree’s falling over was an act of God. The Court agreed. It held that in order for a landowner to have a duty, the evidence must establish that he or she had actual or constructive notice of a patent danger that the tree would fall. There is an exception. 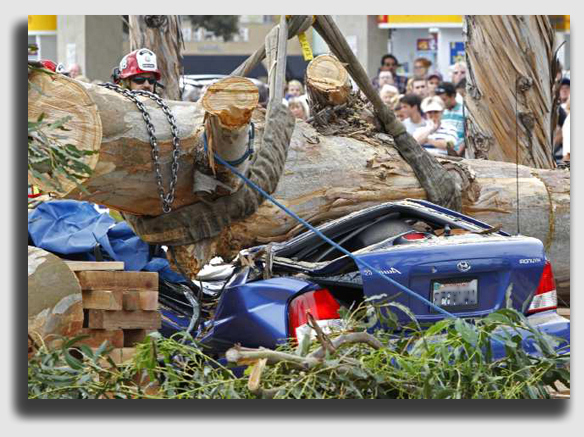 Where the tree overhangs the street in an urban area, an owner may be held liable on negligence principles under certain circumstances for injuries or damages resulting from the tree or a limb falling onto the highway. Generally, an urban owner has a duty of reasonable care relative to his or her trees, including inspection to make sure that they are safe. This dying ash stands on a tree lawn in Norwalk. 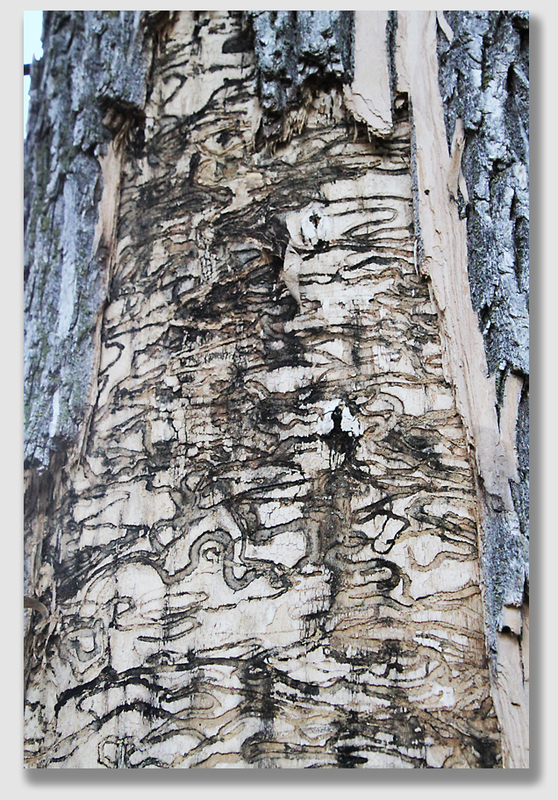 The signature tracks of the ash borer are evident. So Jim may have a problem, beyond the fact that he’ll find no tree-root pixie dust at the nearby Home Depot. The duty to inspect isn’t an issue here. If Jim owns that dead ash tree, he already has notice that the tree’s dead. The bare branches in mid summer, the sloughing bark, and the borer tracks looking like spaghetti done in bas relief, is more than enough constructive notice anyone ever had. Whether the City does something about the dead tree or not, Jim would do well to hire an arborist to inspect the tree. If the tree should go for safety’s sake, Jim shouldn’t wait for the City to do it. Would the same apply if tree roots damaged the sidewalk, making pedestrian passage dangerous? Absent any municipal code relieving property owners of liability for condition of the sidewalks, it would hardly be a stretch for an unfortunate passerby suing under the law of nuisance. Need an illustration? Look no further than Fancher v. Fagella. Our next question: Would the Maple City be liable to remove the tree, independent of Jim’s obligation as a landowner? Wertz v. Cooper, Case No. 06CA3077 (Ct.App. Scioto Co., Dec. 13, 2006), 2006 WL 3759831. Following heavy rains, a tree that sat on Cooper’s property tore loose from its roots, and leaned into Wertz’s fence and into a Shriner Colorado Blue Spruce tree that sat upon Wertz’s property. Wertz sued Cooper, complaining that Cooper failed to timely remove her tree. Wertz sought damages, including the cost of removing the fallen tree, the expenses to replace the damaged Blue Spruce, and other incidental damages. Cooper argued that she had no knowledge of a defective condition of the tree, that she could not have been negligent in failing to maintain the tree, and that she could not be liable for the damage when an “act of God” caused the tree to uproot. The trial court agreed that there was no evidence that the tree was deteriorating, and that Cooper was not liable for an Act of God. Held: Judgment for Cooper was upheld. A negligence action in Ohio requires a plaintiff to establish that: (1) the defendant owed the plaintiff a duty of care; (2) the defendant breached the duty of care; and (3) as a direct and proximate result of the defendant’s breach, the plaintiff suffered injury. In order for a plaintiff to establish the duty element in a negligence action arising from a fallen tree, the evidence must establish that the landowner had actual or constructive notice of a patent danger that the tree would fall. There is an exception to the general rule, however, concerning the duty of a property owner relating to growing trees with limbs overhanging a public street or highway. An owner of land abutting a highway may be held liable on negligence principles under certain circumstances for injuries or damages resulting from a tree or limb falling onto the highway from such property. In addition, there appears to have developed a distinction throughout the United States that there is a lesser standard of care with reference to rural, farm, timber, or little used land as opposed to strictly urban property. Generally, an urban owner has a duty of reasonable care relative to the tree, including inspection to make sure that it is safe. The duty placed upon the urban landowner, who has only a few trees, is not a heavy burden. This is in contrast to the rural landowner who may have a forest full of trees, which would impose a duty of immense proportions, and constitute an onerous burden on the owner. Despite the heightened standard to be applied to an urban tree, Wertz had no evidence in this record to establish that Cooper had either actual or constructive notice of a defective condition of the tree. While Wertz advanced her belief that the tree was dead or dying, her allegation was conclusory. She presented no evidence to support her claim. What’s more, even if Wertz were right that she believed that the tree was dead or dying hardly establishes that Cooper knew or should have known that the tree was dead or dying.